Not many people would consider fruit a suitable candidate for soup. Butternut like the cucumber, contains seeds, which is where its vegetable ruse unravels. The texture of butternut, unlike its gourd relatives, makes for terrific soup. Nutty, maybe not. But creamy, buttery and full of flavour? You bet. With this recipe, you get four flavour variations so you can cook a big batch once and serve it four different ways. 6 cups vegetable or chicken stock – the NoMU Fond Liquid Stocks are a winner if you don’t have stock in your freezer. 1. Place a large casserole pot over medium heat and drizzle in your oil. 2. Add the onion and garlic. Cook and stir for about 6 minutes, until softened but not browned. 3. Cut the butternut into chunks and add it to the pot with the stock and honey. 4. Bring it to a simmer and cook until the butternut is tender, this will take about 15 to 20 minutes. 5. Remove from the heat and allow to cool slightly before blending. A stick blender works a treat in these soupy situations. 6. Season with nutmeg, salt and pepper and serve hot with a dash of cream. 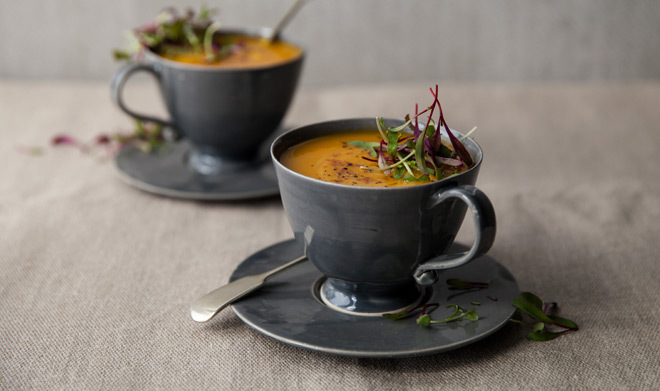 Butternut soup is quite versatile. For a bit of variety try adding 2 tablespoons of green Thai paste and replace half of the chicken stock in the recipe with coconut cream. 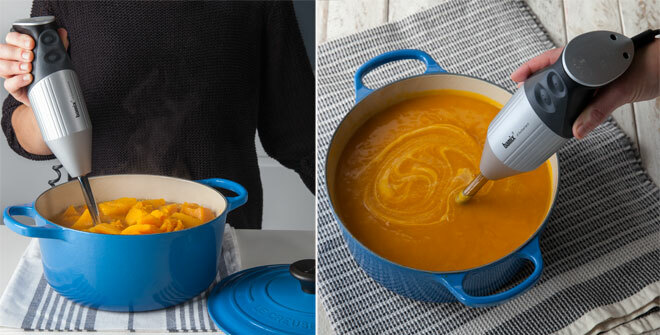 For a lighter, slightly fresher soup you can add the juice of two freshly squeezed oranges and the zest. If your tastebuds are craving something spicier, 2 tablespoons of freshly grated ginger and 2 tablespoons of curry powder should do the trick. Head this way for more homely soup recipes. Quick, easy and healthy. What more could you want out of winter?